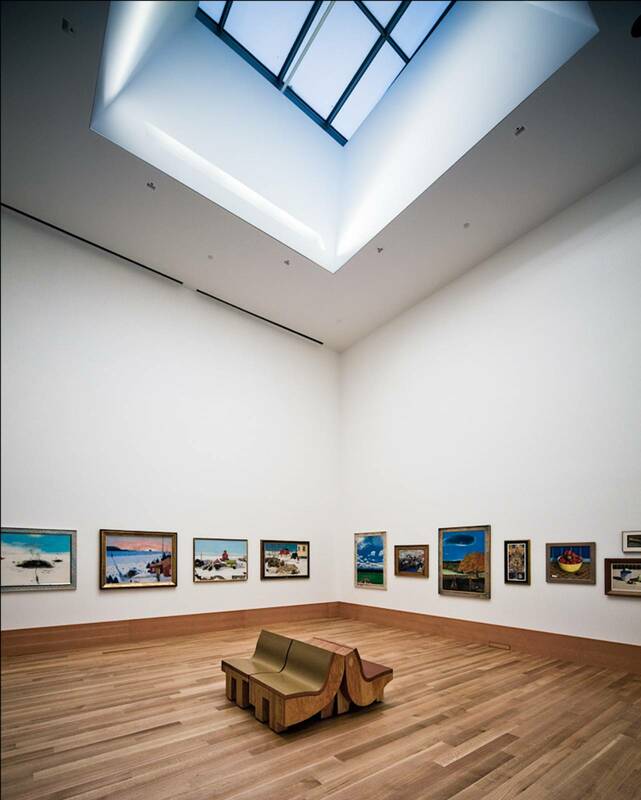 Gehry’s first building in the city where he was born and grew up, the AGO brings the notion of time and memory into subtle play. 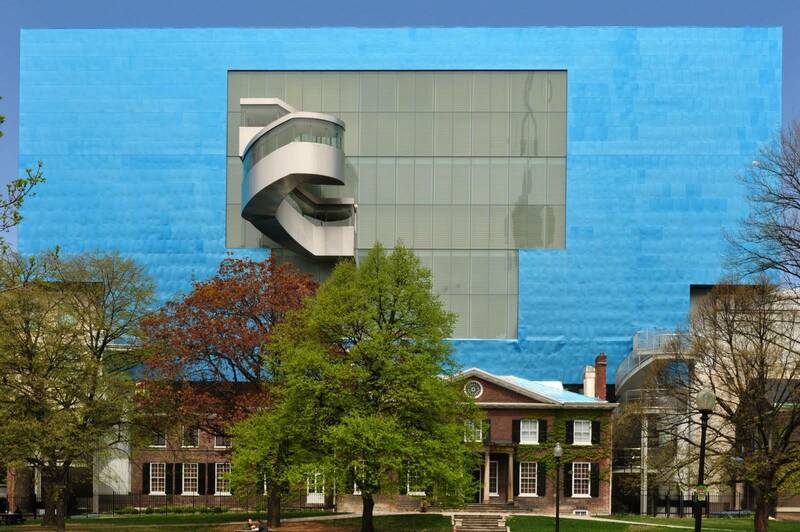 Gehry was born into a jewish family living in one of downtown Toronto’s immigrant neighbourhoods. The architect’s maternal grandparents lived just a couple of blocks away, and he often played in Grange Park adjacent to the museum. He vividly remembers his first visit to the AGO (then called the Art Gallery of Toronto) when he was eight years old and speaks fondly of seeing a John Marin seascape in Walker Court, the colonnaded space at the center of the museum’s original building, by Darling & Pearson. Over the years, though, the prominence of Walker Court in the overall scheme had diminished as the museum expanded piecemeal. In an expansion that opened in 1993, Barton Myers moved the museum’s main entry to the east side of the block, away from the historic axis running through Walker Court and the Grange, the 19th-century mansion that served as the institution’s first home. While the Myers design brought the entrance close to the busy intersection of Dundas and McCaul Streets, it introduced a new circulation pattern that was less direct and more confusing. 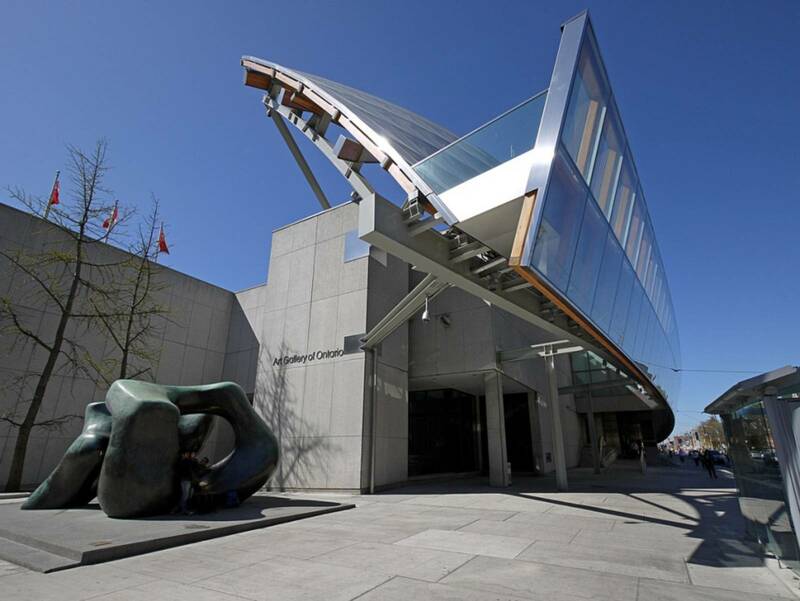 In 2002, publisher and art collector Ken Thomson donated his 2,000 piece art collection and 100 million CAD to the AGO. The gallery knew they needed to expand in order to house this sizable donation. 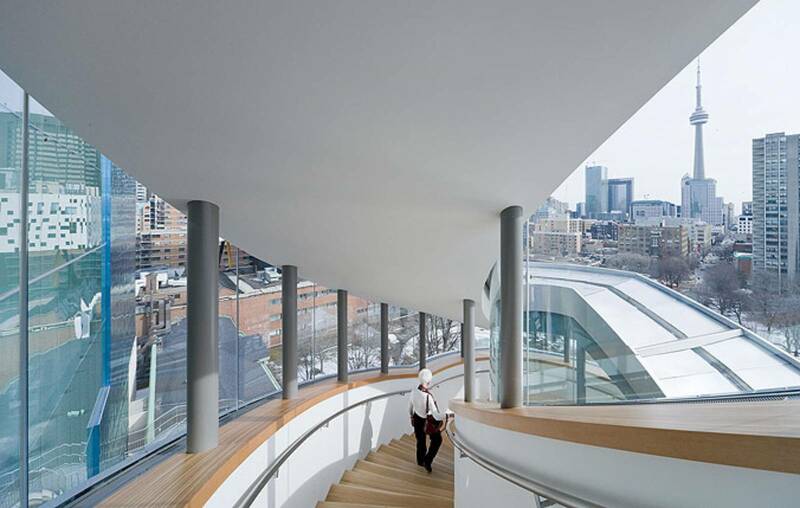 In 2004, Gehry unveiled his design and construction began on the ambitious project. 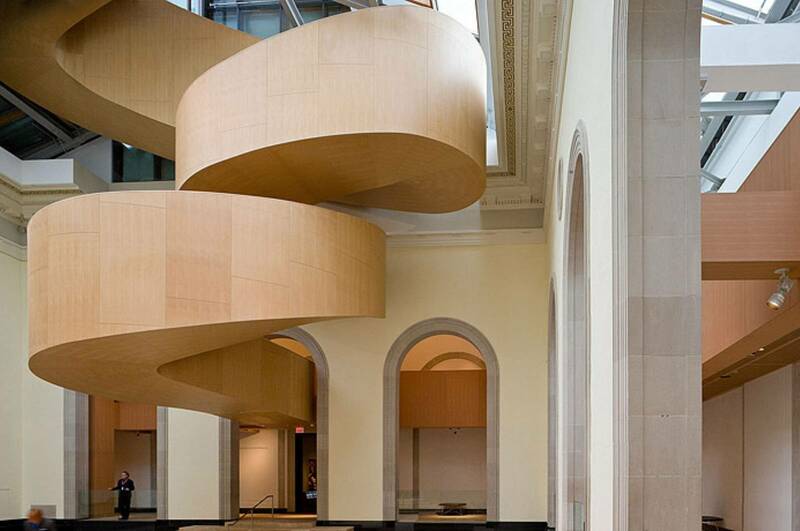 One of Gehry’s first decisions was to return the museum’s entry sequence to the axis he remembers from his childhood, albeit one that now starts at an entirely new Dundas Street facade and lobby. From the outside of the gallery the most striking addition is the long glass façade that covers the Galleria Italia on the north side of the building. Below the glass wall, the gallery’s main entrance has been re-aligned with the center of the building. 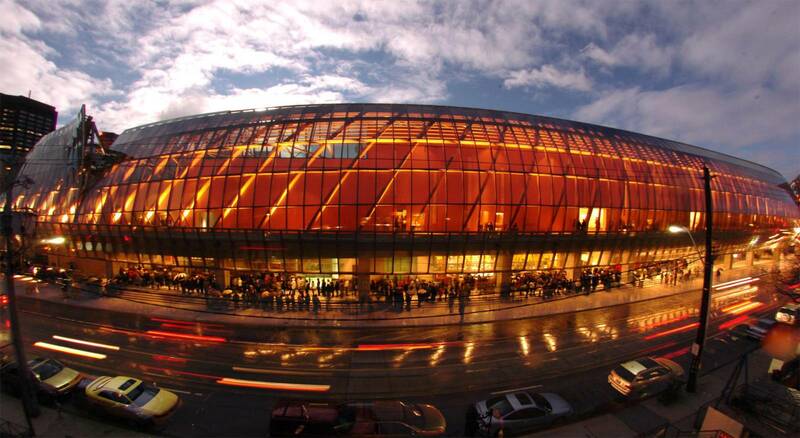 Although the facade’s web of curving, glue-laminated-wood beams injects a dynamic note onto the street, the exposed structure has a rugged, decidedly Canadian, quality to it. 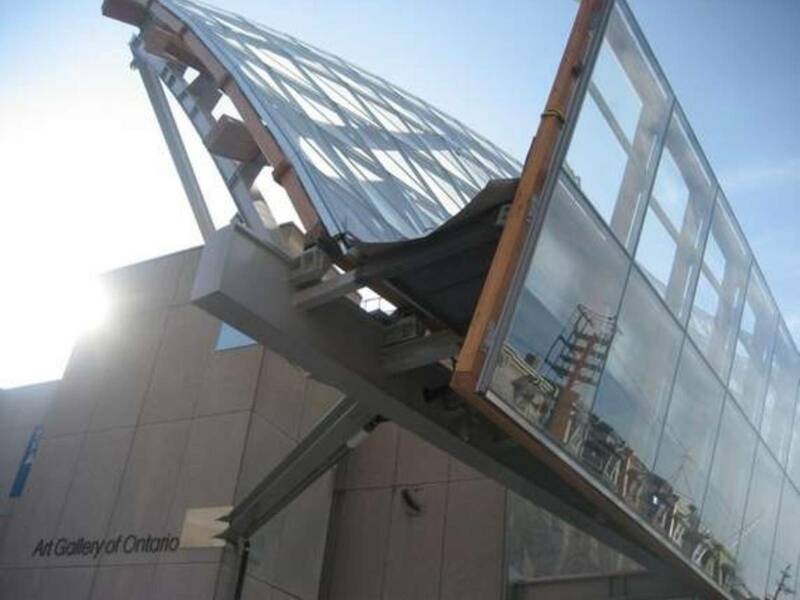 The new gallery is located on the second floor at the north end of the AGO and stretches the entire length of the AGO with its long glass façade anchored to a ribbed wooden structure. The façade measures 137m and overhangs the sidewalk below. The glass curves toward the building at the top, resembling an overturned canoe. the angle of the glass reflects the old victorian row houses across the street from the gallery, juxtaposing the old and new. The wing features four stories that overlook grange park to the south. 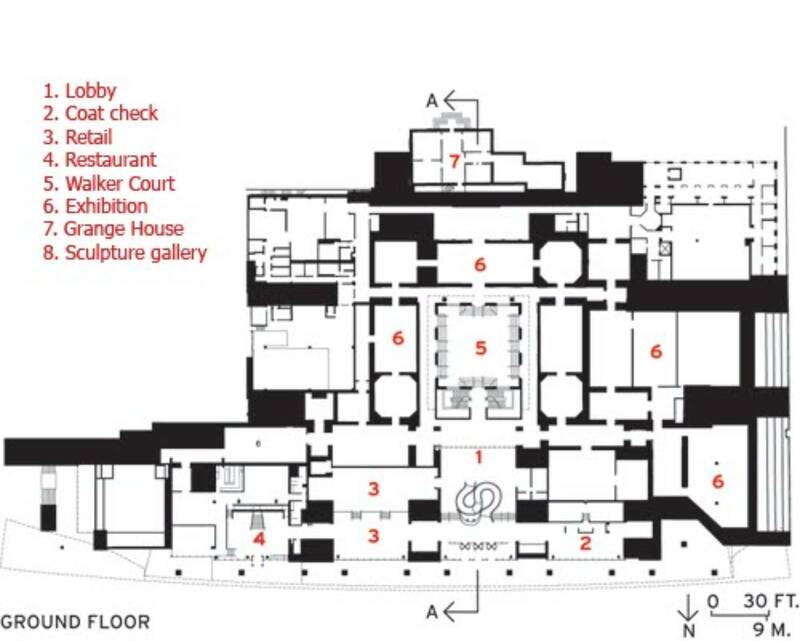 The main level features a glass enclosed sculpture atrium which is link between walker court and the grange building’s member’s lounge. 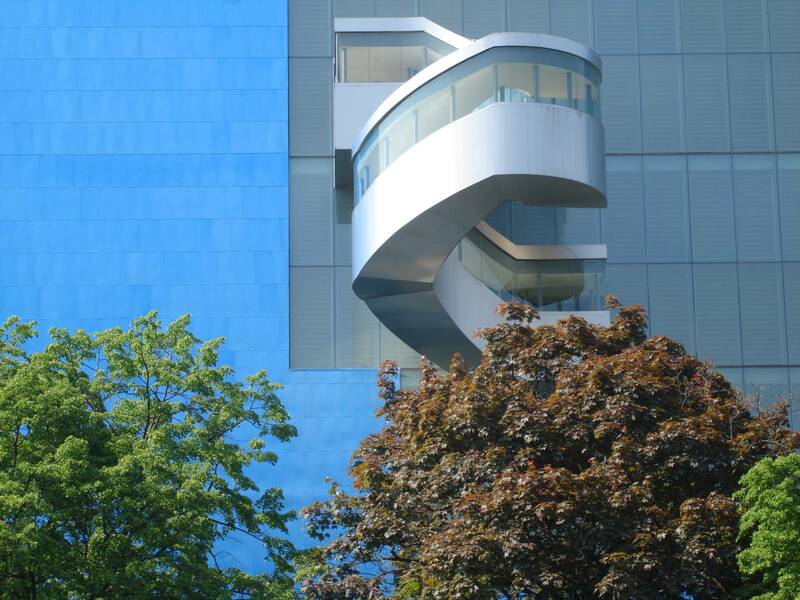 Above the atrium is the first of three levels that are clad in the blue-tinted titanium and glass curtain. the large glass windows on each level have again been humanized with a series of horizontal wooden louvers. 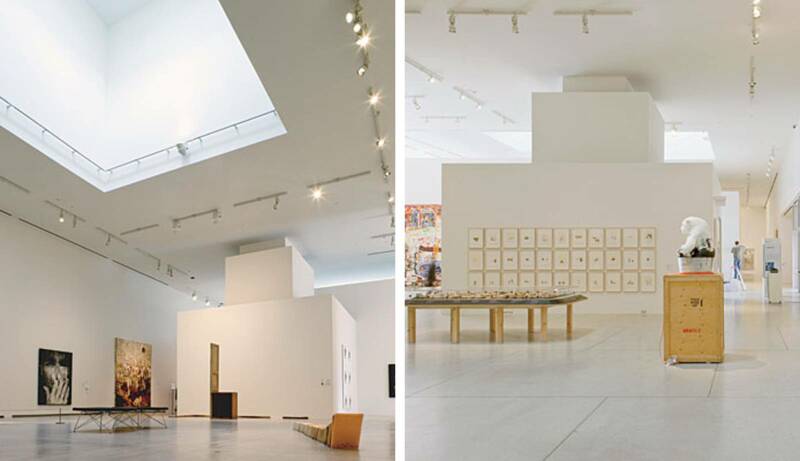 On the top floor, large skylights funnel light into the galleries. 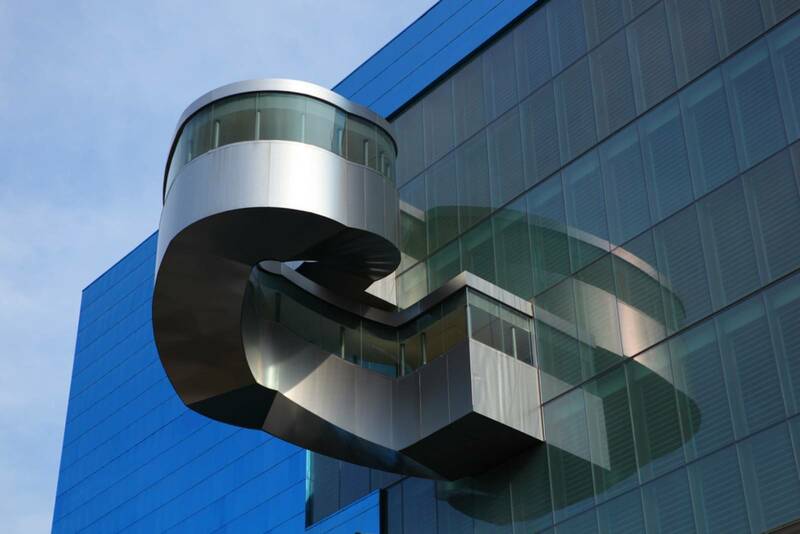 These upper floors are connected by a 1.5m spiral staircase that features windows on all sides. 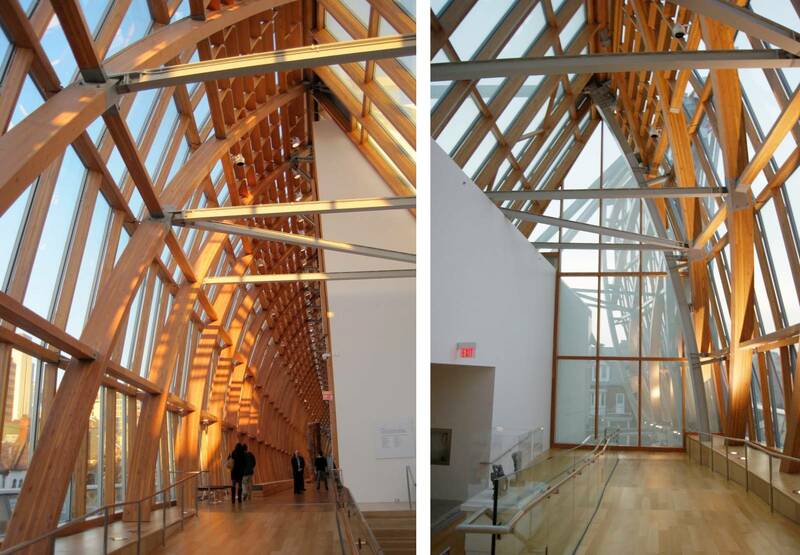 Inside the new Dundas Street addition, Gehry designed a lobby with a snaking accessibility ramp made of 5-foot-high panels of Douglas fir. 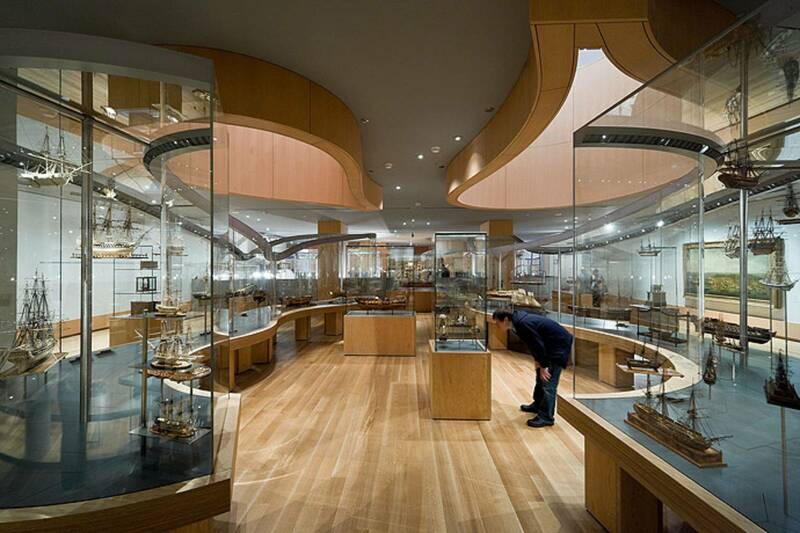 With the ramp, he not only turned a necessity into an attraction, but offered visitors walking on it sneak peeks into galleries one story below where donor Kenneth Thomson’s collection of ship models is displayed in Gehry-designed vitrines. 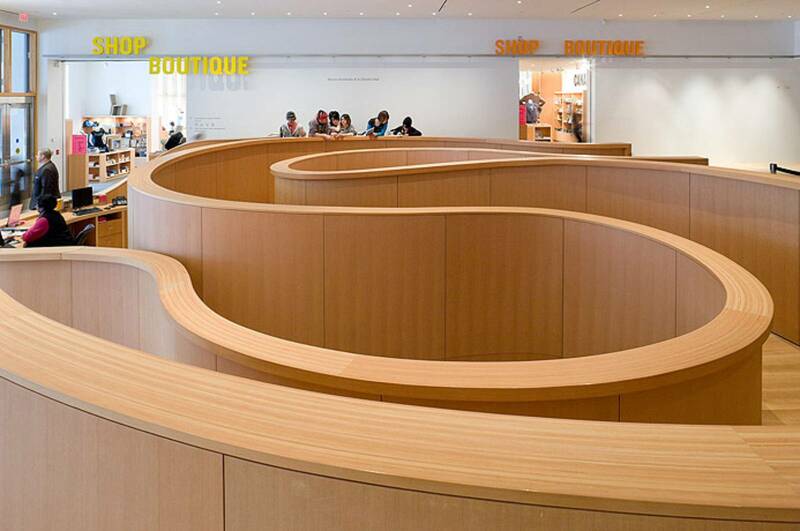 Gehry has grouped the gallery’s bookstore, restaurant, theatre and café to the east. 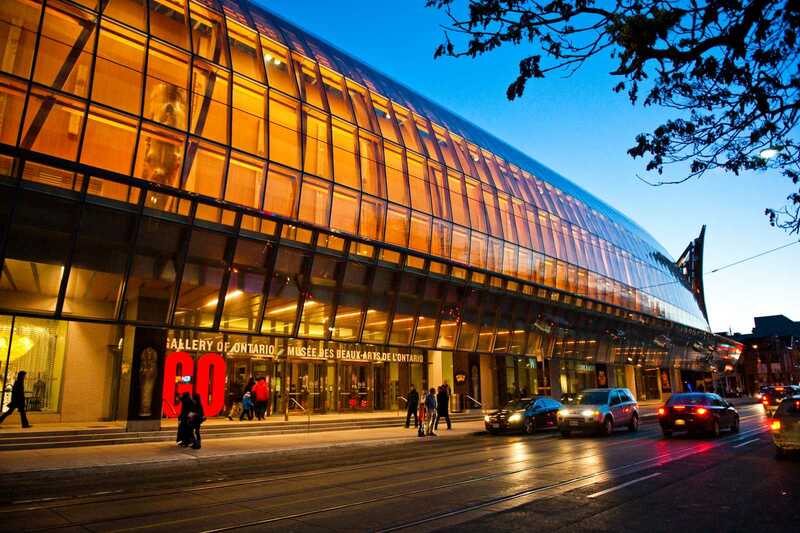 this commercial hub also includes the AGO’s free contemporary gallery. 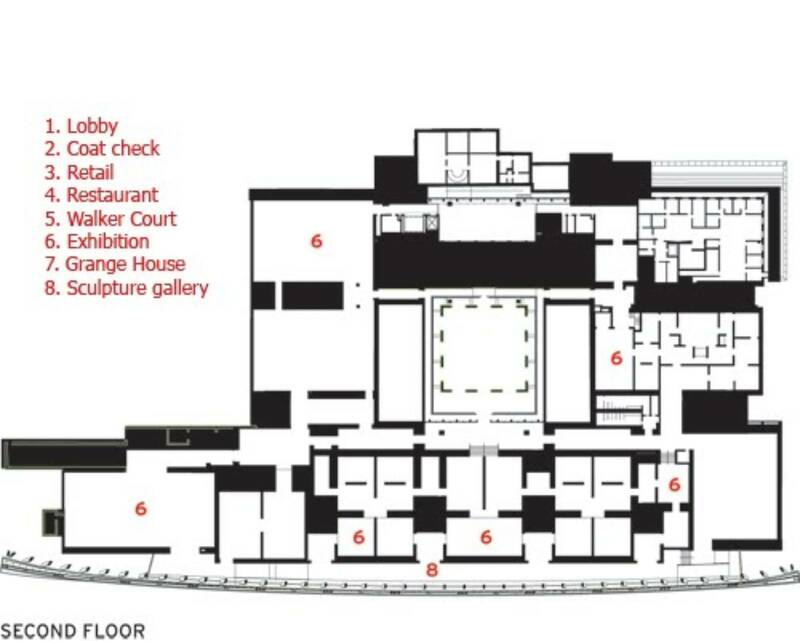 Thanks to the relocated entrance, the walker court, the historic heart of the AGO, now lies at the centre of the building. 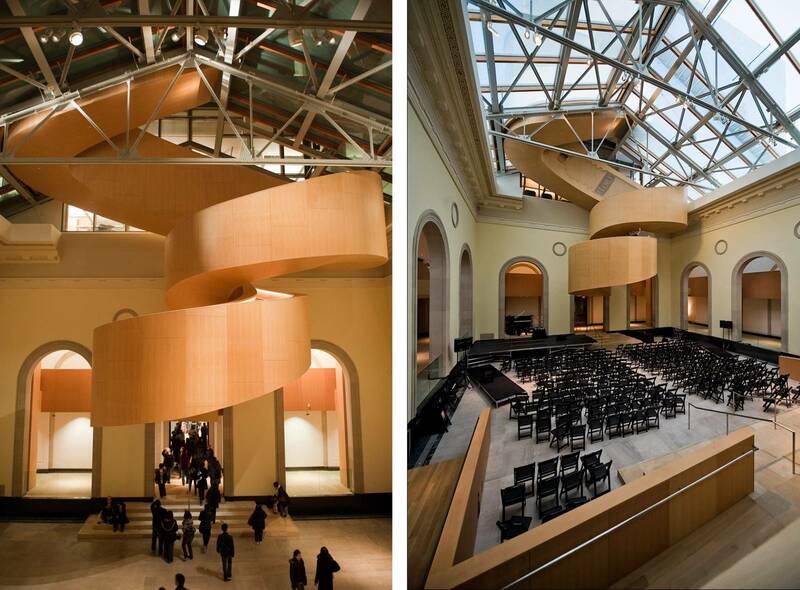 Gehry has restored the court to its original splendour, adding a glass ceiling that floods the space with light. The court looks out toward the street level entrance to the north and the original grange building to the south, which now serves as the member’s lounge. Walking from the second to fifth floors, visitors take a wood-clad corkscrew stair that ascends right through the court’s glass roof and is suspended from the new tower on the back of the museum. 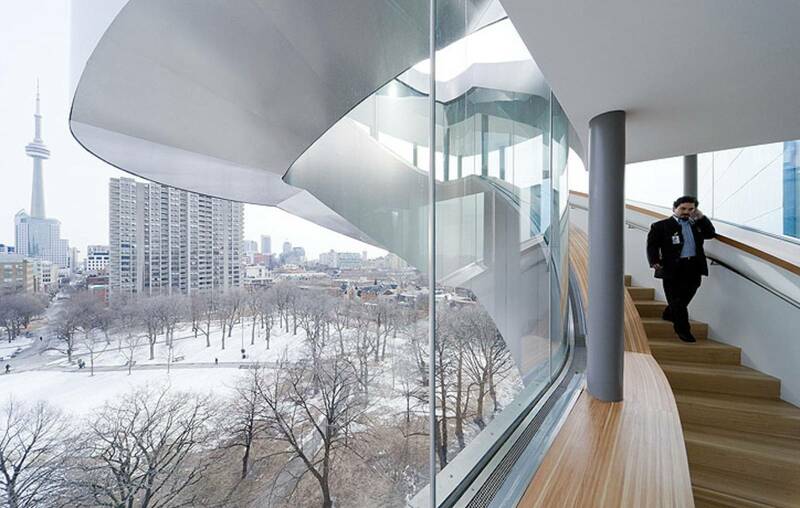 To connect the top two floors, Gehry designed a curving “barnacle” stair that cantilevers out from the south face of the tower and offers dramatic views of the park. 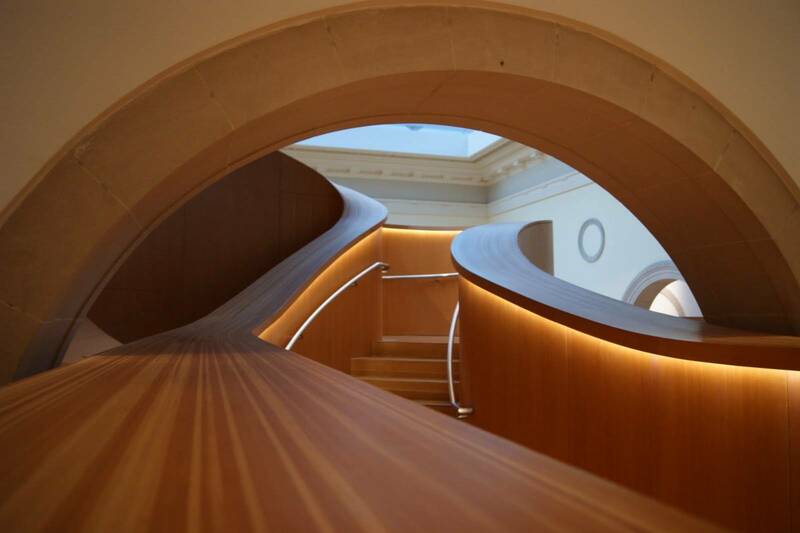 Despite the seemingly disconnected nature of Gehry’s additions, the gallery is now fully unified with a harmonious flow. Overall, the new transformation added 97,000 square feet of space, increasing the available gallery space by 50%. as such, the gallery remains one of North America’s largest museums, now boasting a total of 583,000 square feet of space. My name is Miguel Ortiz-Teed and I am a student and the University at Buffalo: School of Architecture and Planning. Working on my M.Arch. 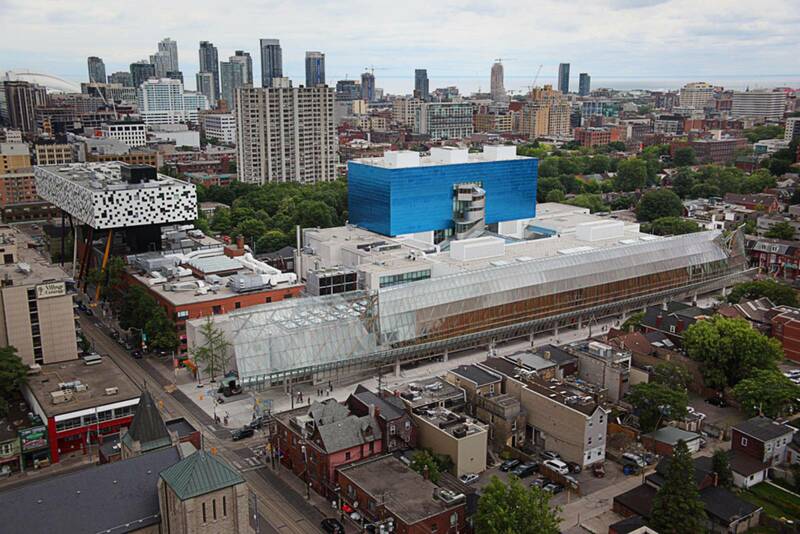 I’m doing research on the AGO and I need to draw an axonometric view of the museum. I am searching for a the plans of the 3rd and 4th floor is possible. If you do not obtain anything like that, could you point me in the right direction.